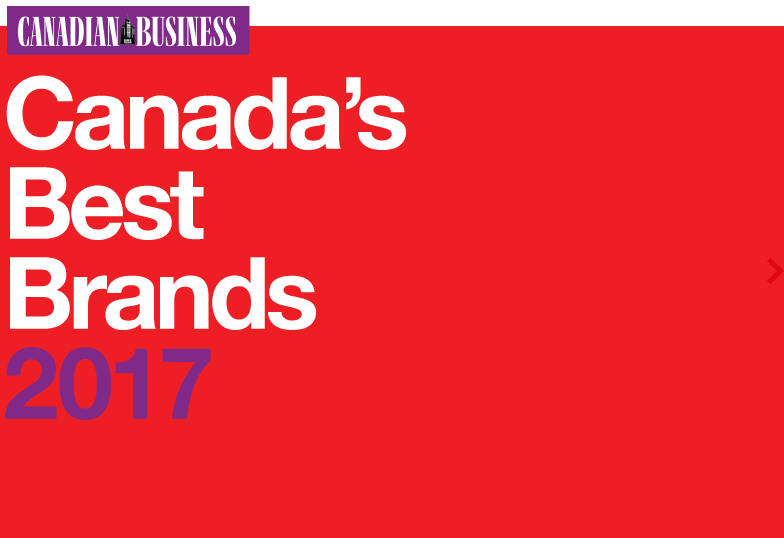 A national survey of Canadian consumers reveals Canada's best brands for 2017. The leading 25 companies have won over the hearts and minds of Canadians. These brands have done this by forging customer loyalty that also contributes to their bottom line. 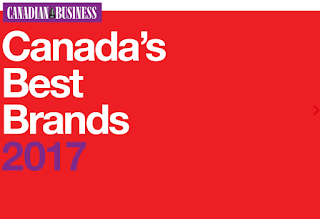 The list of the 25 Best Brands in Canada is the result of a survey of a nationally representative sample of 1,503 Canadians by Rogers Consumer Insights Team. Performed online in July 2016, the poll sought opinions on five key aspects of a company’s reputation (the quality of its products and/or services; its customer service; its commitment to innovation; community involvement; and the person’s overall view of the brand) from people who profess familiarity with the brands. Last year’s ranking: New for 2017! Scotiabank joins the Top 25 this year, riding on tailwinds of financial success and, likely, its cultural sponsorships. Despite the fact that Scotiabank dropped four major Toronto festivals from its portfolio last year—Nuit Blanche, Buskerfest, the Toronto Caribbean Carnival, and the CHIN Picnic—it still maintains its sponsorship of the Scotiabank Giller Prize, the Scotiabank Photography Award, and the Scotiabank Contact Photography Festival. It’s hardly alone; all major Canadian banks sponsor events. But only Scotiabank can boast of its unique relationship with movie theatre chain Cineplex (which also appears on this ranking) and their joint Scene loyalty program. That deal, renewed late last year for 10 more years, has put Scotiabank’s brand front and centre for millions of moviegoers — many of them millennials about to hit the prime age for financial services. Quebec telecommunications company Videotron showed a puzzling slide this year, falling 17 spots. But while that may not be great news, Videotron remains one of only two telecom players to make it into the Top 25 ranking, shutting out cable rivals like Bell, Rogers, Shaw and more. Its status as a touchstone of Quebec Inc. means that while it has little name recognition outside the province, it still commands plenty of attention inside Quebec. This chain controls close to 80% of the movie theatres in Canada and it’s been a highly profitable business lately, with revenue and attendance showing strong growth in recent years. One reason is that ticket prices are also growing: our brand survey was conducted before Cineplex announced an accross-the-board hike in ticket prices in early October 2016, but offerings like VIP Theatres and larger “AVX” screens with reserved seating have helped to drive up the average price of a night out. But blockbusters like Star Wars: The Force Awakens and the surprise box-office success of R-rated Marvel superhero Deadpool kept the seats full regardless of ticket price and cleared the way for Cineplex to break into the Top 25. 22. The Great-West Life Assurance Co. The No. 22 spot on this list was also held by an insurance company last year; The Great-West Life Assurance Company has taken the spot vacated by Sun Life Financial. This brand, a subsidiary of Great West Lifeco Inc., celebrated its 125th anniversary this summer. The slight decline for Rona this year might be attributable to the fact that it’s no longer a Canadian-owned brand. U.S. home improvement giant Lowes took a second, successful, run at buying Rona (after a similar deal in 2012 was blocked by Quebec officials). The newly resurgent chain is expanding again, however, and new blood from Lowes may help it climb the ranks again in future years. Metro saw a minor decline on the ranking this year, but that may simply be because it had a quiet year while its larger rivals—it is Canada’s third-largest grocery chain, behind Loblaw and Sobeys—generated more chatter. The erosion could also be because while the company itself is doing well, Metro Inc. has in recent years converted some of its stores from the flagship brand Metro to its discount brand, Food Basics. Telus held steady in the rankings this year, rising 2 spots. The company’s finances were somewhat hampered this year by the economic slowdown in Alberta: Telus, more exposed to Western Canada than its telecom competitors, saw profit decline near the end of 2015. When BMO polled Canadians on how they felt about the brand in 2014, many were indifferent. The name and logo evoked little sentiment and the brand's most identifiable qualities were "big” and “blue." The bank was certainly growing financially, but struggling to connect with new customers. Two years later, the company has overhauled its marketing, infusing it with "human touch." Take, for example, their 2015 transit campaign that featured mirrored posters, letting customers see themselves in the ads that asked questions ranging from "how are my RRSPs?" to "how's my hair?" It's that dedication to understanding their market, identifying their weaknesses, and adapting quickly that makes Bank of Montreal one of Canada’s best brands. The brand has come a long way since the bespectacled kid stole Canadians’ hearts in the iconic Superfries commercial. Certainly, the path to multi-billion dollar success involved weathering some difficult conditions, including a growing distrust of frozen foods in general. But throughout it all, the globally pervasive company with down-home roots has held strong as one of the greatest business success stories in Canada’s collective narrative. The path from technical apparel to high fashion is perilous (just ask Belstaff, whose runway obsession nearly cost them their street cred before they found their way back to real motorcycle gear). Canada Goose may be facing some heavy weather on that path these days. Acquired by Bain Capital in 2013, the company set off in search of growth. Its product line began drifting away from arctic survival and self-consciously towards the status of its label. In fashion, there is no more reliable recipe for sharkjumping. This year’s drop of six spots on our ranking might be a warning. With brand love in short supply this year, any gain is notable. But when that gain vaults you straight to number 15 on the list, it merits a closer look. For Sobeys, the explanation certainly isn’t corporate success: its 2013 acquisition of Safeway has been a fiasco, culminating in a $942.6 million loss and the departure of its CEO. Look beyond the boardroom drama, however, and Sobeys has focused effectively on old-fashioned brandbuilding, from its continued partnership with Jamie Oliver’s Food Revolution to the launch of its Joy of Eating Better Foundation in Quebec, to in-store Nutella Cafés. The result: significant improvements in its scores for both community involvement and product quality, proving that, for a grocery brand at least,the way to consumers’ hearts is still through their tummies. After a rough ride on the markets in 2015 and a lousy winter for SkiDoos, it would be tempting to read Bombardier Recreational Product’s slide on this year’s list as a sign of trouble ahead for this spinoff of fabled Bombardier. But the smart money says that might just be a hiccup. While its stock steadily marches back to health, BRP continues to diversify its recreational vehicle offerings, giving it access to customers beyond toy-loving weekend warriors. It’s often the case that brand health is a leading business indicator for marketers, but BRP’s showing in this year’s survey might just be behind the game. As the federal government moves slowly but surely toward the decriminalization of marijuana, Shoppers is looking to stake out its spot in the future market for legal weed. “We’re an industry that is extremely effective at managing controlled substances,” Galen G. Weston, president and executive chairman of Shoppers parent company Loblaw, said in May. That’s not the company’s only strategy for growth, though—in August it bought B.C.-based QHR Corp., a digital medical records company, for $170 million. That should help it stay competitive as medical care increasingly moves into the cloud. The Quebec-based drugstore chain prides itself on being your friendly, neighbourhood pharmacist. Indeed, the family-run business is a mainstay across the province (and in French communities in New Brunswick and Ontario) where loyal customers favour the simple, low-price goods to competitors’ high-end cosmetics and designer perfumes. It’s a model that’s carried the brand and its 400 plus franchises for three generations, and one mthat CEO, François Jean Coutu is doggedly keen on sticking with. Look no further than TD for an example of how to build rock solid customer loyalty –– an increasingly important trait in a market promised to be overhauled by tech startups. The company stands apart from the snore inducing image associated with most financial institutes, thanks largely to innovative marketing strategies, like the recent TD Rolling Renovations campaign. The 40-city tour saw the bank team up with HGTV and DIY Network to offer home reno advice while promoting its home equity loans and lines of credit. Staying on top of the fiercely competitive cheese market is no easy feat. But the family-run company from Quebec has managed to do just that, both in Canada and globally. Recognition and love for the brand has been building for decades in step with each new acquisition and growth phase the company enters into. Today, at $10 billion in revenue and $14 billion market cap, Saputo is not only an omnipresent multinational brand, but one that Canadians are proud to call their own. When the City of Ottawa needed to commission a fashion retailer to design Canada’s official 2017 centennial threads, Roots was the obvious choice. The company has long been the go-to brand for attire that screams casual and warm; the ultimate in Canadiana. After 43 years in business, grey sweatpants, plaid, and puffy vests remain Roots staples, and still, shoppers can’t get enough. Luckily, the retailer is poised to infiltrate the Canadian consumer landscape even further with 14 new stores. It’s difficult to put reputation points on the board if your brand doesn’t interact with consumers on a regular basis. That’s not a problem IMAX has these days. Every one of 2015’s 10 top grossing films worldwide was released somewhere in IMAX form, indelibly attaching its brand to what is arguably the last, greatest communal experience in modern culture. But IMAX’s recent interest in its brand’s voice is more than just a vanity. Following a trail blazed by brands like Intel, it’s redefining its offering from being a technical curiosity for movie studios to being the mark of films that matter, and a feature that consumers will demand. At nearly 100 years old, Canada’s favourite grocery chain isn’t slowing down. Quite the opposite, in fact. From redefining how we think about in-house labels, to stocking drugstores with quality produce, to entering the digital health game, this is a brand that’s managed to spread its influence without ever losing its core identity. There was drama in the boardroom at Canadian Tire this year, as CEO Michael Medline was dismissed after just two years so that his predecessor, Stephen Wetmore, could take the reins again. But that didn’t appear to have harmed the company’s brand with consumers. That’s likely got something to do with the “Wow Guide,” a 200-page print catalogue that Canadian Tire reintroduced after a 10 year absence and distributed to 12 million Canadian households. Ink on paper isn’t the Tire’s only trick, of course—this year we named it one of Canada’s Most Innovative Companies for its bold forays into digital signage and Facebook marketing. Today there are 20 different Cirque du Soleil shows operating worldwide (seven of them in Las Vegas alone). The most recent is Luzia: A Waking Dream of Mexico—produced with the help of a reported US$47.7 million investment by the Mexican government. In the wake of Cirque’s sale to private equity interests in 2015, the pressure is on to make that acquisition pay, and it shows. Unfortunately, Canadians may be noticing, too. The combination of ubiquity and commercial expediency (an Avatar-themed show?) is hard on a brand that was built on stunning originality. It probably explains Cirque de Soleil’s slight swoon in the ranking since last year. There’s perhaps no other brand as entwined with the Canadian identity as Tim Horton’s. That’s why when the company was sold to American fast food chain Burger King, the nation felt communally slighted. But two years later, loyalty to the brand hasn’t wavered. In fact, the company has managed a successful U.S. expansion (finally) and diversified its menu, while maintaining its signature taste, community vibe, and feel-good marketing campaigns sure to make any hockey mom tear up. In 2013, Westjet aired a video ad showing community members in the Dominican Republic sharing their Christmas wishes with Santa who, along with Westjet staff, later showed up to the disadvantaged community bearing gifts. The video was viewed over 40 million times, exceeding its view target by 7,000%. Since then, the airline has rolled out dozens more experiential ad campaigns across social media, reinforcing its brand as personable and helpful. Years of cultivating that reputation meant that when WestJet stepped up efforts to assist with evacuations from Fort McMurray, Alberta during its devastating 2016 wildfire, it felt like a natural step for the company, not a cynical public relations maneuver. Home Hardware jumped 10 spots this year, perhaps reflecting the shuffling of the deck in the home improvement category as competitor Rona was bought by U.S. giant Lowe’s. There’s no single reason for Home Hardware’s climb; it’s a combination of consistency—the company has had just three CEOs since its founding in 1964—and its slow-and-steady approach to modernizing its retail experience (the company is four years into a five year plan in which it told dozens of locations to shape up or leave the chain). Home Hardware’s folksy reputation is due in large part to the fact that it’s not a traditional top-down franchise operation; its dealers collectively own the company and have more latitude to respond to the particular demands of their home markets. And apparently the approach is resonating: Home Hardware was named one of Canada’s Best Managed Companies by Deloitte Canada for the fourth time running this year. Once an exclusive (albeit crunchy) club for the niche climbing community, MEC has become one of Canada’s most beloved companies. The five-year rebranding process focused on bringing urbanites into the fold by introducing more accessible outdoor activity lines for walking, running, and cycling. Meanwhile, as the product line diversified, the company simplified the brand itself by losing the mountain from its logo, announcing the start of a more inclusive era for outdoor retail. That evolution has been a hit with consumers, keeping MEC in the top spot in our ranking for the second year in a row.